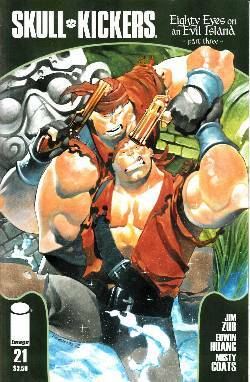 MIGHTY SKULLKICKERS: A classic relaunch that blazes a new trail with familiar fan favorite sensibilities. A bold, new direction, a continuing story and a brand new adjective! Our twenty-first issue is brand a new #1! Our B cover is a variant with the original numbering, in case readers want their issue super-duper "old school." P.S. Retailers: Shelf this numero uno alongside other "Mighty" comics you may have hanging around the shop. Tell them it's the latest and greatest thing, because it IS!